Dan and Jon. Loren and Kurt for a couple of days. Kevin one day. Howard and Todd one day. So here we have it, finally, the trip report you have all been waiting for, from the most anticipated trip of the century!! In August Jon and I visited the Disneyland Resort in California for 6 days, for the first time together. We had both been before, on separate occasions. But both of us agreed that we had never really felt like we had “experienced” the resort properly before. Jon only having spent the odd one day visit there in the last couple years, and me only having only ever been twice - once for 4 days, and one day trip. My last visit being over 5 years ago! As you can imagine, we were mega excited - especially me, since so much has changed in 5 years; and of course there is so much that I had never done on my 2 very short trips in the past, also. I won’t go into too much detail about every single thing we did, because that would get dull, but instead will comment on things that stuck out, or were special. So we arrived just after opening on that late August day, and made our way to Disneyland Park first. The first ride we went on was the Finding Nemo Submarine Voyage. I have to say that I was very impressed with this, and it has become a firm favourite of mine. Sadly we only got to ride it once, but I look forward to being able to go on it many times again in the future! It is just so different from any other normal attraction. The effects are cool, and it is a long ride too. Definitely worth it! I have compiled a big list here of everything we did (that I can remember lol) during our trip. Continue reading after for more trip report! Characters that were new to me this trip, which I was very excited about were Flik, Max, Handy Manny, Sulley and Helen Incredible. New outfits for characters I had met before were Chip and Dale in their Western jackets, winter coat Jasmine, Steamboat Willie Mickey, Chef Goofy, Chef Chip and Dale, and Chef Pluto (all from Goofy’s Kitchen), Polynesian Daisy and Minnie, California Goofy, California Minnie, California Mickey, California Donald and Minnie in her apron from her character breakfast. We managed to see the Celebrate! A Street Party a couple of times and although it is good to watch, it is certainly not an adequate replacement for a daytime parade. What Disney are thinking I have no idea. I can’t believe that they have left their premier Magic Kingdom parade-less! We also saw the new Magical fireworks, which were neat to see but they apparently aren’t as good as the last fireworks (which I didn’t get to see). While we were there, there seemed to be a lot of issues with the fireworks too. Out of the four times we saw all or most of Magical, there was only one occasion where there was Tinker Bell and Dumbo, which is really sad because I would have loved to get more pictures and video of them. But as it was, we saw them the once, as at least we DID see them! * Mickey not having an fireworks come from his fingers when he points (which I might point out makes him look really silly just standing there! Jon and I also both agree that Fantasmic! just does not work at Disneyland. We are hardened Disney fanatics as you all well know, and we found that it was almost impossible to avoid the congestion, the crowds, and the sheer lack of organisation by Disneyland when handling Fantasmic! 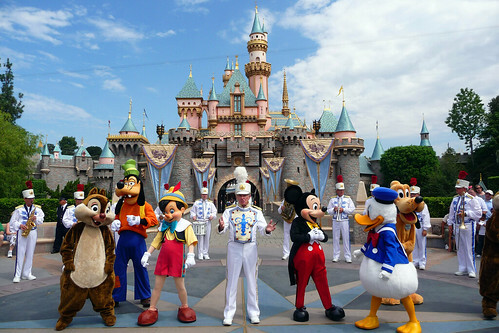 It is an ENORMOUSLY popular show there, and it is located on the Rivers of America. The walkways around the RoAm are narrow and surrounded by either the water, or restaurants and attractions on the land side. The biggest problem for us is that we were there for 6 days, we can come, literally, thousands of miles to be there, and wanted the best experience possible. But with the entire park descending upon the RoAm by 7pm everyday, soon a 12pm closing seems pointless as it basically blocks off the entire of Frontierland, New Orleans Square and Critter Country. And it doesn’t do much for Adventureland either. We feel that our experience of Disneyland was actually lessened by the fact that Fantasmic! ran at least twice a night (usually 3) while we were there. They actually could have dropped shows to be honest. Disneyland is busier at the quietest of times, without mass congestion spanning half the park - all for a show. This organisation problem also seemed to spill over into other areas of the resort too, and we feel that maybe they need to take a step back and look at how WDW organise things. They pretty much have it nailed there, and given their years of experience, Disneyland should too. Jon and I also both agreed that DCA isn’t as bad as the DL regulars would have you believe! As non-frequent visitors, we enjoyed DCA a lot. Of course there are improvements to be made, but then I have never been to a Disney Park that is perfect (far from it. Just look at the current state of EPCOT and the Magic Kingdom). DCA gets a lot of bad press, and in my opinion for not very good reason at all. I look forward to seeing the cool new changes, but they really didn’t have to demolish half the park to achieve it. While at Disneyland we managed to experience several breakfasts, including 3 character ones, and one at the Carnation Café. The character meals we went to were Breakfast in the Park with Minnie and Friends, Goofy’s Kitchen, and Lilo and Stitch’s Aloha Breakfast at the PCH Grill. I have to say that I was very impressed overall with all three meals. There were plenty of character opportunities, and the food was good each time too! Each meal was buffet, although the Stitch breakfast did offer a menu. Minnie and Friends: Chip, Dale, Tigger, Pooh, Eeyore, Minnie, Max Goof, Fairy Godmother, Hook and Rafiki. Goofy’s Kitchen: Goofy, Baloo, Jasmine, Prince Phillip, Chip, Dale and Pluto. Lilo and Stitch’s Aloha Breakfast: Lilo, Stitch, Daisy and Minnie. We always love to do the character meals because it gives you the opportunity to meet more random characters, and also characters in new and different outfits - for example chef outfits at Goofy‘s Kitchen, or Polynesian ones at the Aloha Breakfast. I have to say that the characters at the meals in Disneyland Resort were a lot more friendly and easy going than at WDW; and in a lot more abundance too! In WDW you only ever get 4 or 5 (sometimes), and they are always the same characters each time. At Crystal Palace it will ALWAYS be Pooh, Tigger, Eeyore and Piglet. Always, and other restaurants don’t vary their own selections much either. On top of that, just TRY to get more than one character in a picture at WDW! It just won’t happen for love nor money! Whereas in DL one morning, we managed FIVE! Yes, five characters at the Minnie’s Breakfast posed for us! So overall the character meals were fun, and definitely worth the experience and money! I mentioned before that it had been a long time since my last visit to DL. Since my last visit (which was only a day trip anyway), a lot has changed. Bug’s Land has opened, Tower of Terror has opened, there are new fireworks and parades, and some other general cosmetic stuff too. Of course some of the most drastic changes since my last visit were over at DCA. It was cool to finally get to see A Bug’s Land. The area is actually overall not the most elaborate area in the Disney collection, but certainly has some cool theming and some charm. Luckily one day, quite randomly, Flik was out for a meet, and Jon, Loren, Kurt and I have a great memory of, to paraphrase Loren, leapt over the table to meet Flik! (We were dining at Farmer’s Market when I happened to spot him). I look forward to seeing the other major changes that are coming to DCA on a return visit in t he future! A lot has changed in 5 year, and a LOT more is set to change in the next 2 - 3. Speaking of Flik brings me to characters overall. Sadly, Disneyland is not well blessed when it comes to characters. They DO have some cool ones, and some different outfit for the more common ones, but overall, there isn’t anybody at DLR that you can’t meet elsewhere. And it isn’t just there isn’t anyone different, there is an actual LACK of characters. They don’t have characters at DL that are pretty much expected at other resorts! I have been informed that even characters such as Rafiki and Pinocchio aren’t too common when it comes to meets - yet for me, I try to avoid those when I go to WDW and DLP as they are always out on every corner! We got to see the new version of the Electrical Parade on several nights, much to Jon and mine’s delight. The new additions included Tinker Bell, Dopey and the Dwarves Mine, and Pinocchio. Of course this was at the expense of the Dumbo float and the Blue Fairy. So not so much additions as replacements (which always makes me sad, as there is no need to get rid of old favourites in favour of new stuff - why can’t we have both?). Anyway, it was cool to see, and was glad that I was finally able to get some decent pictures of it. One thing that I was very excited to see was the new version of the Sleeping Beauty Castle walkthrough. The original had closed some years ago, and I had never gotten to see it. But they recently revamped the effects and tableaux’s, and we finally got to see it on this trip. We also got to go into all three DLR hotels, and I have to say overall I was fairly impressed. I loved the Grand Californian, and would love to stay there sometime! The Paradise Pier is fun, and the Stitch breakfast was of course great! The Disneyland Hotel was ok, and I’m sure the rooms are nice, but it wasn’t my favourite, and it could do with some updating! But the breakfast there was cool too. I hope to one day be able to stay in all of them! Disneyland Resort sadly suffers from the same affliction as WDW when it comes to wasted space. DLR is by no means small, but it isn’t the largest of the five resorts, either. DL Park is the 4th in ranking when it comes to MK style parks size, though it fares well overall with attractions. Both DLR parks have loads of wasted areas, such as Innoventions, the old SkyWay buildings, PeopleMover track and buildings, Princess Fantasy Faire (possibly the most pointless waste of space in the history of Disney! ), and the Ranch Arena. There are more areas, but I won’t list them all. I would love for Disney to really take a step back and look at these areas and add new stuff. We can dream! Finally, we got to go to EMH one morning and also Toontown Morning Madness. EMH was pretty much like EMH everywhere else - earlier entrance time, fewer people, but fewer rides open! Toontown Morning Madness was fun and involved going along to Toontown first thing in the morning to celebrate being made honorary Toontown citizens. Attranctions were open, and characters out for meets, and there was a little show in front of Toontown City Hall too. Overall a fun experience. So that’s if for this report! We did have an amazing time, and I’d just like to thank once more all the great people we met there who made our trip extra special. We look forward to doing it all over again real soon! !